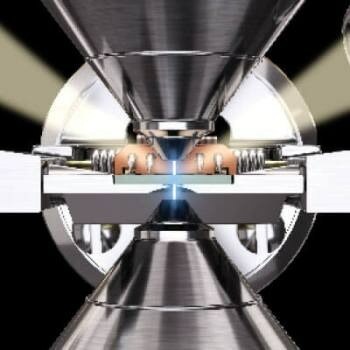 The Fusion from Protochips precisely regulates electrical and thermal processes within the electron microscope, allowing users to examine sample behavior. The Fusion converts your TEM or SEM into an in situ laboratory using the flexibility of MEMS-based E-chips that deliver exact, precise experiment controls. With picoamp level electrical biasing and rapid temperature changes up to 1200 ºC, the Fusion is able to deliver unrivaled experiment versatility, speeding up your research effort. The Fusion enables users to load samples into the microscope effortlessly, program waveforms for cyclical testing, and manually modify electrical and thermal conditions in real time, using its Clarity workflow-driven software. Delivering reliable thermal and electrical performance, even during tilting, the Fusion utilizes a wide range of E-chips to control one’s experiments. Available in a variety of different configurations, Protochips’ robust series of E-chips allows users to customize one’s experiment effortlessly. With the ability to evenly heat to 1200 °C and deliver picoamp level electrical biasing, the Fusion delivers unparalleled sample control, while sustaining direct line-of-sight to EDS detectors, and enabling maximum counts per second. Protochips’ E-Chips are calibrated and inspected before shipping, thus accuracy and precision of experimental results are ensured. All the Protochips in situ holders are run by Clarity workflow-driven software, using a wide range of MEMS-based E-chips and accessories to ideally fit one’s research requirements. Each of these components is fully approved by the leading microscope manufacturers to meet their demanding standards for reliability, safety, and compatibility.